Kensington offers an effective shading solution to every commercial establishment in the UK. Our atria and skylight window blinds provide maximum protection from the sun, while maintaining the natural beauty of the building. Kensington’s Skyshade™ is a range of blind systems catering for the increasingly popular design-led buildings that feature large glazed atria and glass openings, in both vertical and horizontal planes. Large areas of glass significantly add to a building’s character and appeal, but at the same time can create significant challenges when it comes to solar shading. To counter the effects of prolonged exposure to sunlight and heat, we at Kensington highly recommend installing skylight window blinds. Skyshade will only add to the already pleasing building design, whilst increasing productivity and worker comfort, reducing building running costs and providing a unique interior finish. It gives the shade necessary to improve your workplace without spoiling the appearance of the structure. You can do business as usual, but in a more comfortable and efficient environment. 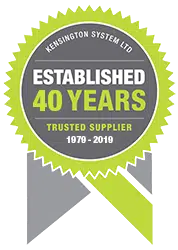 Kensington provides guidance and assistance from design to installation, making the process easier for customers. We will help you choose the most appropriate type of blinds for your building. Once you call us, we will arrange a visit to your site and perform an inspection. This enables us to get the dimensions and create a design plan that meets the standards and requirements of your project. We will install your blind system properly to ensure the best performance and a long service life. We have a team of highly trained and experienced personnel. Our commitment to quality and customer satisfaction makes us the preferred choice for commercial property owners in the UK. Flexibility: Blinds can be single, double or triple operation from one motor to correspond to window bays. They are suitable for many applications, including horizontal, sloping, bent and arched constructions.